Video Editing - Simple Steps to help you Edit your Video Footage. 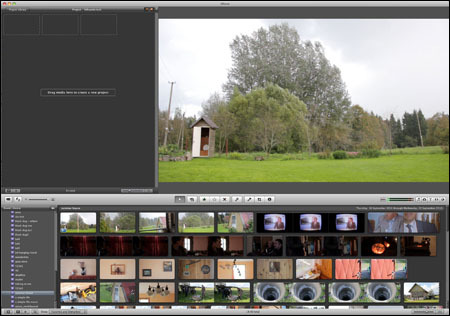 "Simple Steps using Free Software to Edit your Video Footage." Most HD DSLRs have a direct HDMI out. It is therefore possible to shoot some footage, plug your camera into your HD TV and show your friends your masterpiece straight away! Great, right? No! Step away from the HDMI cable! Consider your workflow as a stills photographer. You probably wouldn’t consider shooting a job, and then simply handing over your rolls of film or memory card to your client or other third party, without first editing and then almost certainly post producing your images. With moving images, editing is arguably even more important. Star Wars Editor Paul Hirsch said, “The shooting of the movie is the truth part, and the editing of the movie is the lying part.” I also like to think of it as the part when you can add a bit of magic. There are many options available for editing film, from high end professional programs like Avid, Premiere and Final Cut Pro, to some fantastic free options like Apple's iMovie and Windows Movie Maker. If you are new to the world of film, I suggest using a free application to begin with - both the Apple and Windows offerings are extremely capable and simple, and both allow you to import, edit and export high definition movies. For the purposes of this article, I used Apple's iMovie '09 (version 8.0.6), and footage shot on a Canon EOS 550D at 1920x1080, 25fps. Despite what you may read, iMovie is capable of editing H.264 native footage (the .MOV files that come straight out of your 550D) without the need to convert. When working with movies, you will need a different workflow than with stills. While you can import a lot of movie file formats directly into image browser programs like iPhoto, or the browser utilities that come with the camera, if you want to use them for editing rather than just clip viewing, you’ll need something more manual. 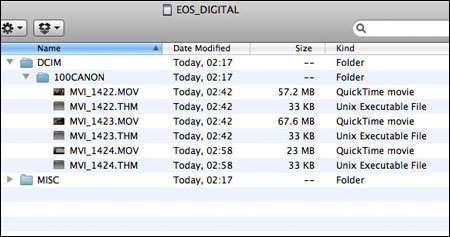 Most HD DSLRs use 'self contained' file formats - where each clip is saved as a single AVI or MOV file - which can be easily located and copied. You should copy all of the files from the relevant directory on the memory card (including the .THM files, which are used by some editing programs as clip thumbnails) to a hard drive, before importing them into your editing software. This avoids the need for your camera to be plugged into your computer throughout the import process, and is very fast. You can select multiple files by clicking the first required file and then shift+clicking the final file. Choose a location to save the files to Choose an external drive if you have one dedicated to your movie work, or leave as is to save in iMovie's default location. Choose an Event to import the footage into. 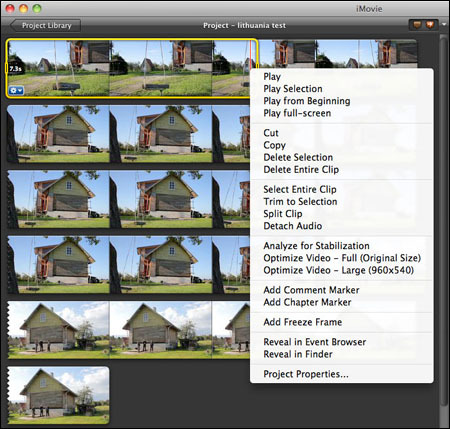 iMovie organises raw footage into 'events', so choose a relevant existing event, or create a new one for a new project. You can use events to organise footage into scenes or shots if making a longer movie. You can select to Optimise Video. This converts your video into Apple Intermediate Codec. I only suggest doing this if your machine struggles when previewing your footage. Copy or Move files. Again, as long as space is not an issue, copy the files so that your originals are safe. 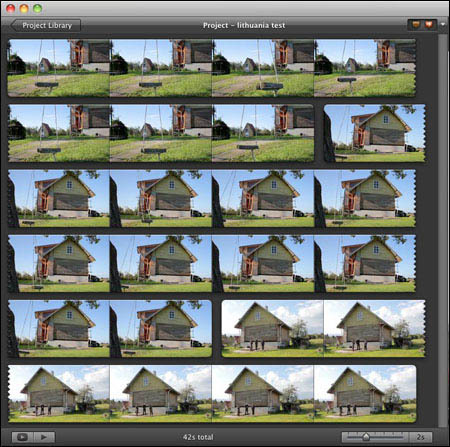 iMovie is non-destructive, so even if you choose to move your files, it is reasonably safe. Clips are automatically imported as standalone shots. If you click on a clip in the browser, you can press Space Bar to view the clip in the preview window, or rightclick on the clip to view it full screen. There are lots of other options from this main screen, but for now you just want to get used to having a pool of raw clips in your event browser, a timeline window where you will build your movie, and a preview window where you can watch your clips and edited movie. The first stage of your edit should be to build a rough sequence of shots. Simply click on a clip in the event browser, and drag it to the empty timeline. Click on the next clip you want to appear, and drag it onto the timeline after the first clip. If you want to insert a clip in between two clips, just drag a new clip and drop it in the gap between the two. You can also reorder the clips in the timeline, by dragging them and moving their positions. Just by dragging and dropping, you can quickly build a basic sequence of shots. Once you have a short sequence of shots on the timeline, you can begin editing and refining the shots. Like any good application, iMovie has more than one way to skin your cat. You can make basic edits right in the timeline, or you can use more precise tools to do the same job. You can edit clips in the timeline by clicking on a clip to select it, bringing up a yellow box around the selection. You can change the length of the selection by dragging the ends of the yellow box. Then, either right clicking or using the edit menu, you can Trim to Selection or Split Clip. Trimming leaves just the area selected by the yellow box, and splitting will chop the clip into smaller clips using your selected end points. Unless you used a tripod and remote, you will want to trim the beginning and end of every clip to remove the inevitable movement (however small) created by starting and stoppin movie capture. Once you get into the rhythm, you will find this process very quick, and it will make a huge improvement to the look of your edit. Clicking the small Cog dropdown menu on a selected clip reveals the precision editing tools. The Clip Trimmer allows you to trim a clip, and choose which part is selected in a more precise way. It also reveals the non-destructive nature of the timeline - you will see the selected section which appears on your timeline, and also the unused section, which is still there. The Precision Editor allows you to accurately edit the point at which a cut or transition is made between two clips on your timeline. 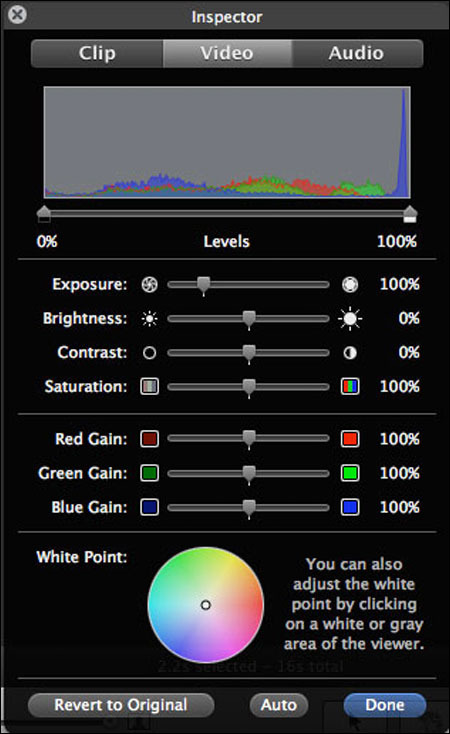 Dragging the blue dot moves the position at which the edit occurs. Using just these few editing tools, you should now be able to put together a refined edit of your shot sequence. 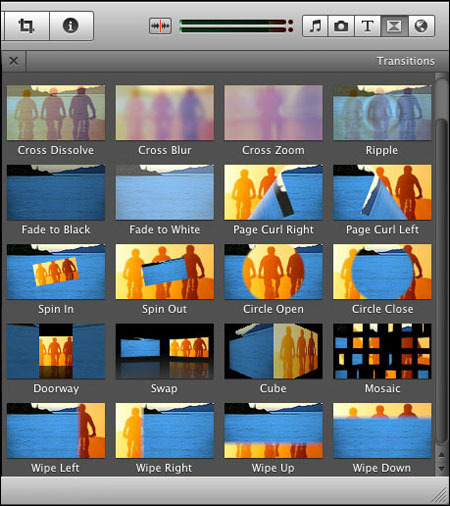 iMovie contains a library of basic transitions - effects that join two clips together. You can go crazy with Star Wars style Wipes, Ripples and Spins, but most movies and TV shows get by using just Fades, Cross Dissolves and straight cuts, so I'd suggest leaving that Mosaic transition in its box. To apply a transition, drag it from the Transition window to the timeline between two clips (or to the beginning or end of your film for fade in/fade out). You can then edit the length of the transition, and change the style by double clicking on its icon in the timeline, which brings up an Inspector window. You can choose to have the same length of transition applied each time, or change it according to your needs. You should now have a basic edit, with trimmed shots and a few selected transitions. Now it is time to refine the look of the footage, making sure all the shots are balanced, and adding any effects that might be needed. 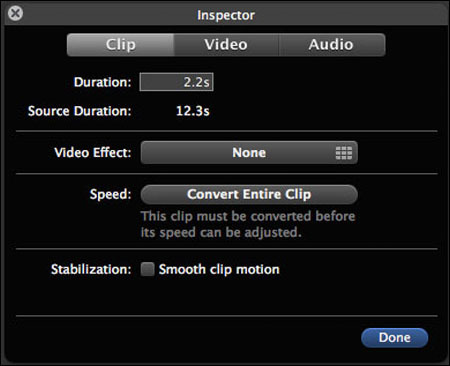 Select a representative clip and click the Cog dropdown (or just double click the clip) to open the Clip Inspector. 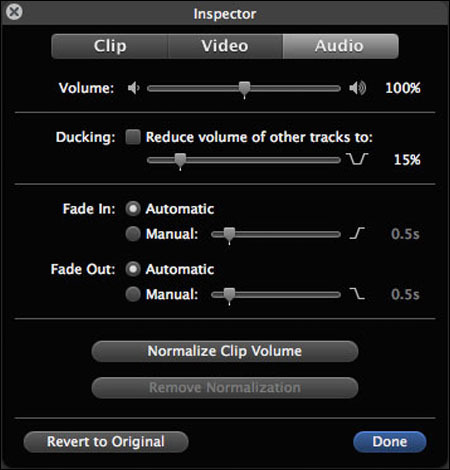 On the Clip tab, you can add an effect to your clip if required, change its speed and add stabilisation. Effects should be used sparingly - they are not adjustable, simply on or off, and are best avoided if possible. The Audio tab allows you to change the volume of the clip's audio, how long it takes to fade in or out, as well as Ducking any other audio - for instance if you have a soundtrack playing throughout the film that needs to get quieter in order to hear the dialogue on a clip. The Video tab has extremely powerful grading tools, offered up in an albeit non-precise way - sliders only. 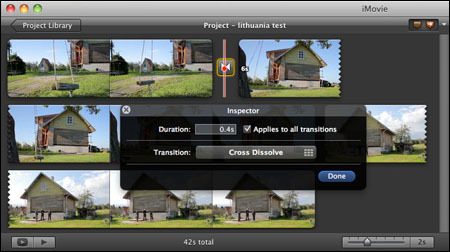 iMovie allows the levels of a clip to be altered, as well as offering separate controls over exposure, brightness, contrast, saturation, individual RGB sliders and an overall white point selector. Play around with these controls subtly, and you should be able to achieve anything from contrasty black and white through a yellowing Super 8 film stock, to a desaturated art cinema look - the possibilities are huge. You can always revert to the original footage at any time, so you may as well give it a go. What if you have 40 clips that all want the same basic treatment? To avoid the time consuming tedium of having to adjust every similar clip, you can copy and paste styles and effects. Simply select the graded clip and copy it. 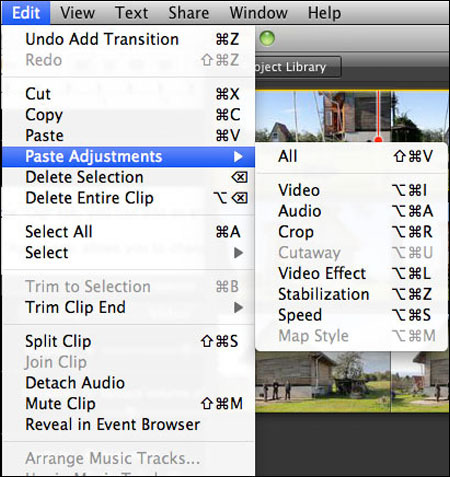 Select the clip you want to alter in the same way and choose EDIT > PASTE ADJUSTMENTS. You can choose to paste all of the settings or just one aspect. After you have completed one clip to your liking, basic grading on the whole project takes just minutes. Minor adjustments can then be made to individual clips as required. iMovie 11, which is being released at time of writing, will introduce enhanced audio controls, which should allow for noise reduction and better general volume controls, but even in the current version you can add multiple layers of audio simply by dragging them from the Music and Sound Effects window, as well as controlling the volume of individual clips. Balance your audio, before adding music and sound effects. 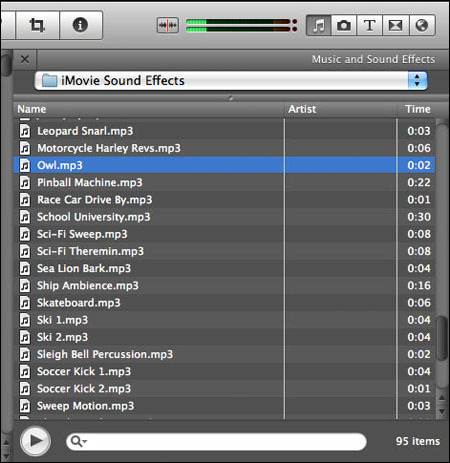 iMovie contains some basic soundtracks and effects, and it's not too hard to find royalty free audio on the web. If all you can hear is wind from the built in microphone - all is not lost. Just mute the audio and add a musical score - it can sometimes transform what you have shot into something surprising. If you intend to do a film with a musical soundtrack, you may want to add the audio track early on, so you can edit to the music. You can add stills from your iPhoto library by dragging them from the dedicated tab. The Ken Burns Effect, which animates stills by having a start and end point, is added automatically by default, but you can edit the settings by selecting the clip and clicking the Crop icon, or turn it off completely by selecting Fit. 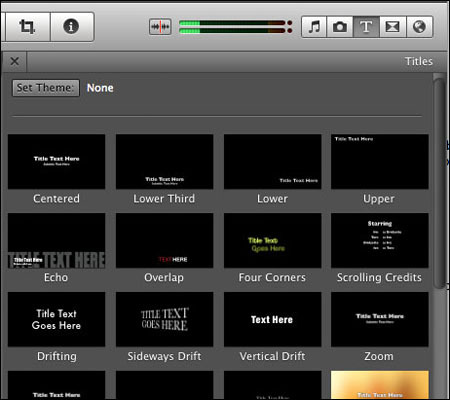 When you have your final edit, you can add some credits or titles using the very simple tools built in to iMovie. Again, err on the side of subtlety to add professionalism to your film - avoid My Great Day Out at Camber Sands written in Chalkboard. 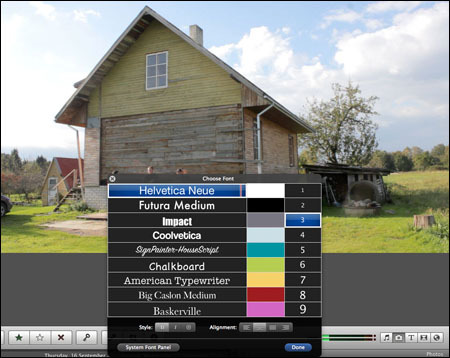 You can choose the font, size, colour, style and duration, as well as the basic look - just drag your choice from the Titles window, and click the text in the Edit window to edit it. Move your text around on the timeline by dragging it, and change the length of time it appears and time it takes to fade by double clicking it on the timeline to open an Inspector window. Finally, you have completed your first film - it looks like a Hollywood blockbuster, and you've given yourself credit for being writer, director, editor, soundman and best boy - time to share your talents with the world! 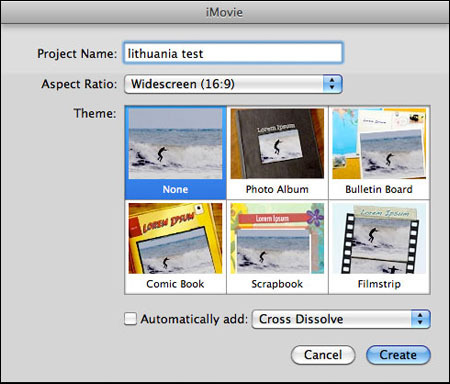 iMovie is a powerful application for exporting high quality video. Under the Share menu, you will be given basic presets which work brilliantly for the given environments - YouTube, iPhone, HD, etc - and you may never require more, so simply choose how big you want it or where you want to show it and click go! But what if your little blockbuster gets chosen to be shown at a festival that requires a ProRes file? No need to panic. If you export Using Quicktime, you will find dozens of professional industry standard codecs, and myriad options for exporting your project in broadcast quality and above at almost any size. With the rapidly expanding market of affordable DSLRs capable of capturing high definition video, it's a good idea to be able to turn that footage into something watchable that you can share with a wider audience. Applications such as iMovie and Windows Movie Maker allow you the opportunity to produce professional results, with minimum outlay and a very shallow learning curve. Try making a three minute movie and practice your editing skills. You maybe be surprised with the results that are possible using free software and a little patience. "Article first published in the RPS Journal December 2010/January 2011 - No reproduction without permission." Take a look at Will's other articles on DSLR Video. How to shoot great movies with your DSLR Video Camera. Ensure your Movie has the best possible Sound Track. Return from Video Editing to the Better Photographs home page.